Make birthday memories and choose a children's birthday hat, first birthday hat or personalized birthday hat to match a birthday outfit and your child's party them. 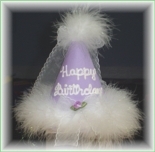 Each hat is customized for your birthday celebration. Birthday hats made in custom and unique styles with a little flare and whimsey complete a birthday celebration and make children's birthday photographs and memories special. 1st birthday hats make wonderful keepsakes and can be kept and treasured by you and your little one as he or she grows. Many are even used for your children's children when they time comes! And, to make the celebration even more personal, each hat can be customized with your child's name or 3 initials monogram. Don't forget our birthday bibs and socks for further cuteness and for protection of your little one's birthday outfit from cake and other party goodies! Monogrammed Birthday Hat, 1st -7th Birthday Hat For Girls & Boys. Happy Birthday Hat Monogrammed Personalized For Girls & Boys. 1st Birthday Number Hat For Girls And Boys. Disney Birthday Hat, Mickey Mouse Minnie Mouse Birthday Hat. Ladybugs Birthday Hat For Girls. Happy Birthday Hat Hand Painted In 3 Colors. 1st Birthday Hat for Babies Hand Painted. Birthday Boy Hat Hand Painted in 3 Colors by Pretty Little Things.